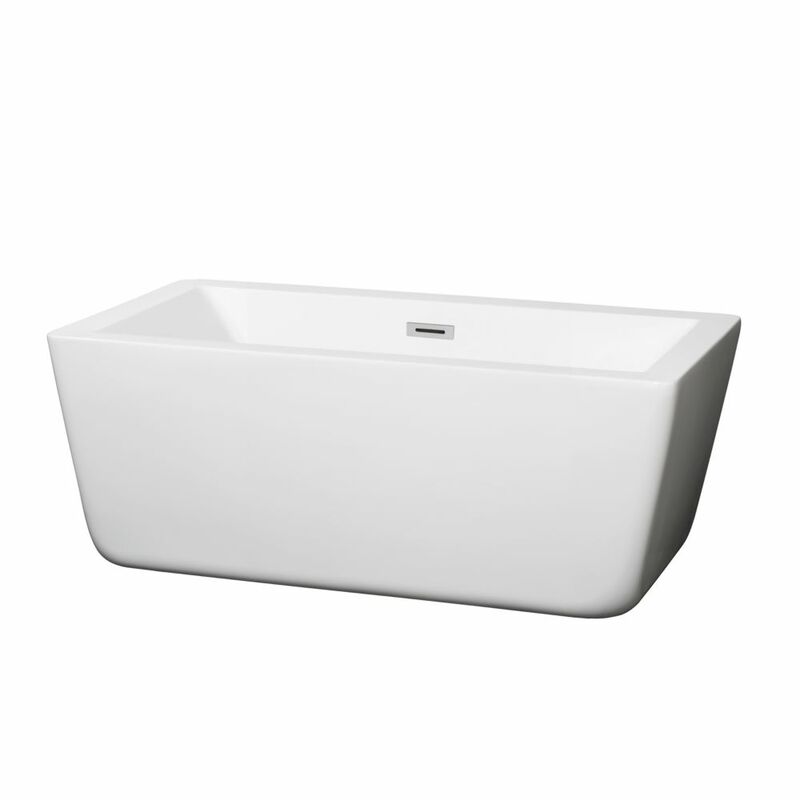 Deep enough for soaking, the Laura 4.92 ft. Centre Drain Soaking Tub in White is the perfect choice for smaller baths. Acrylic construction is strong, light and warmer to the touch than typical enamel/steel tubs. Included drain allows for quick and easy drainage. Perfect for deep soaking, the Emily 5.75 ft. Centre Drain Soaking Tub in White is deeper than standard tubs for full immersion and supreme relaxation. Contemporary styling and clean lines contribute to the freestanding bathtub's modern aesthetic, sure to enrich your bathroom ambience and add a hint of serenity. This unit includes a floor-mounted single-handled brushed nickel faucet along with overflow and drain outlets in brushed nickel to complete the setup. The acrylic construction is strong, light and warmer to the touch than typical enamel or steel tubs, allowing for easy installs and heat-retaining soaks. Laura 58.75-inch Acrylic Flatbottom Centre Drain Soaking Tub in White Deep enough for soaking, the Laura 4.92 ft. Centre Drain Soaking Tub in White is the perfect choice for smaller baths. Acrylic construction is strong, light and warmer to the touch than typical enamel/steel tubs. Included drain allows for quick and easy drainage. Laura 58.75-inch Acrylic Flatbottom Centre Drain Soaking Tub in White is rated 4.7 out of 5 by 6. Rated 3 out of 5 by Miago from We did a lot of research but this tub was so much smaller than anticipated. I’m 5’5” and my legs ... We did a lot of research but this tub was so much smaller than anticipated. I’m 5’5” and my legs were scrunched. Seemed good quality but we returned for bigger. Rated 5 out of 5 by Natasha from Beautiful tub, solid sides doesn't look cheap. We can't... Beautiful tub, solid sides doesn't look cheap. We can't wait to have it installed. Warning sides are approx 3" thick, so the interior is approx 6" more narrow and shorter then overall length and width. Makes a big difference as far as overall soaking space. Rated 5 out of 5 by Cindy from This fits the space, is high quality and I love... This fits the space, is high quality and I love it! Rated 5 out of 5 by Glenda from Very nice tub. Small footprint but nice to soak in.... Very nice tub. Small footprint but nice to soak in. At 5'9" my legs my legs won't stretch all of the way out, but it fits in the area we had perfectly. Rated 5 out of 5 by rubberduck2017 from I decided to go with a bigger drop-in tub so I returned it. Nice tub though. I decided to go with a bigger drop-in tub so I returned it. Nice tub though.